News Article - RSLN Hits 10,000 Users! 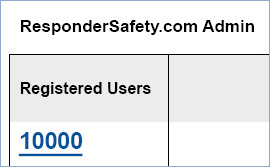 The ResponderSafety Learning Network hit 10,000 registered users today!We are excited by the progress.Based on the size of our potential user group, we believe the current enrollment to be a fraction of the audience that we will develop in years to come.Our goal is to have more than 35,000 users by the end of this year and to double that each year after. Thanks to the Department of Homeland Security and FEMA for their support through the Fire Prevention and Firefighter Safety grant program that makes the Network possible.In addition we have developed partnerships and received strong support from the United Sates Fire Administration, US Department of Justice, the Federal Highway Administration and the National Fallen Firefighters Foundation.Other supporters in the private sector including VFIS and Provident are valued partners. We invite other entities to join us in our goal to make the roadways safer for responders. The network has only just begun with its programming and has already delivered close to 15,000 credit hours to first responders on our highways.Our audience is made up of Firefighters, Police, DOT, EMS and Towing professionals. New programs are coming out on a regular basis; programs like Emergency Lighting and dealing with traffic during vehicle fires to name a few. Please let your brother and sister first responders know about the ResponderSafety Learning Network.Our goal is to improve safety on the roadways for responders and the public, while reducing congestion that triggers secondary incidents. Many agencies are looking for ways to integrate our network into their training programs. We have developed a solution.Shortly we will communicate information about our Secondary Reporting System so use of our network for continuing education will be easier for users and agencies to track progress. If you are interested and would like advance information please let us know. Thanks again for your support from all of us at the ResponderSafety.com team.